Flyer: What Do Parents Really Think about Digital Learning? What Do Parents Really Think about Digital Learning? 85% of parents say that the effective use of technology in school is important to student success. Top concern? Technology use in school varies from teacher to teacher – more parents are concerned about this than about student Internet safety or data privacy. Parents have voted and 55% chose a “blended learning” model as the best for their child; in second place, the traditional classroom environment (42%). Over 2/3rds of parents agree: it is important for students to use a laptop, tablet or Chromebook during the school day. Why? Mobile devices provide easy access to online textbooks, increase student engagement and extend learning beyond the school day. 41% of parents say they would buy a mobile device for their child to use in school – if the school allowed that. Age of parent, grade level of child or community profile (urban, rural, suburban) doesn’t make a difference. 11% have already done this! Facebook continues as the primary social media tool for parents: 61% say they use it often or all the time. Up and coming for those new digital parents under 29: YouTube (43%), Pinterest (37%), Instagram (29%). Just like students and teachers, parents say watching online videos can help with learning – support different learning styles (64%) and students can re-watch videos as many times as needed (59%). 55% of parents say they want their child’s teacher and school to communicate with them via text messaging to a mobile device: only 5% said that in 2010! Schoolwide Internet access (55%), digital textbooks (50%), mobile apps for learning (48%), laptops for every child (46%) and online educational videos and games (41%). #10 And I’m willing to help pay for that! Good news! 64% of parents say they would pay an annual technology fee to support digital learning expenses. 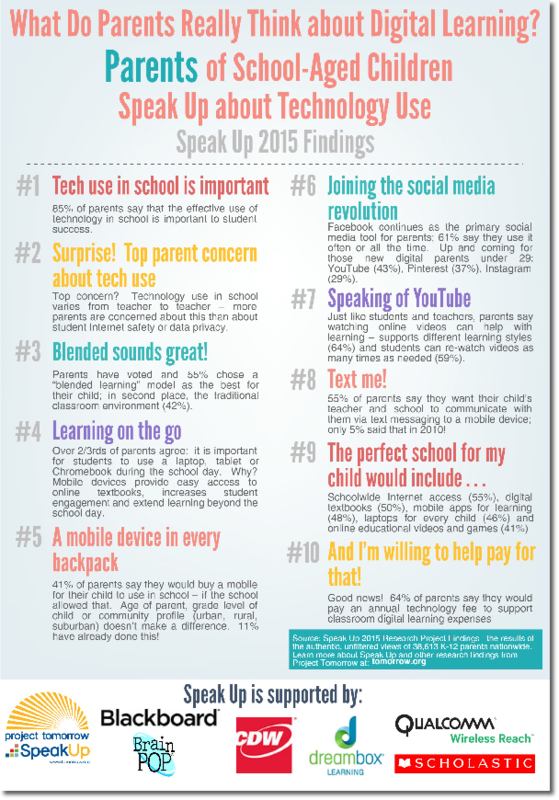 Source: Speak Up 2015 Research Project for Digital Learning Findings - the results of the authentic, unfiltered views of 505,676 K-12 students, parents and educators nationwide.